Yesterday I was pleased to see it was still light when I left work at 16:15 – the days are getting long 🙂 I went to buy food, and arrived home at about 17:00. Getting out of the car, I looked up at the sky and to my surprise, the aurora was out even though the sky was still very light! I quickly grabbed my camera and our brand new fisheye lens (Samyang 8mm f/3.5). It’s a tricky lens: manual focus and manual aperture setting. I drove to Telegrafbukta where I found a gale blowing the snow around. I didn’t dress very well so I was soon freezing, and the wind was so strong it made my (very sturdy) tripod move. Not the best conditions to try out this new lens, but I had no choice as Paul took my other wide-angle lens to Austria :D.
Anyway, despite all this, I am quite happy with the results. It’s fun to be able to capture the aurora right overhead. The fisheye lens gives extremely distorted images, I might try to play with some software that can correct this, but I haven’t had time yet. 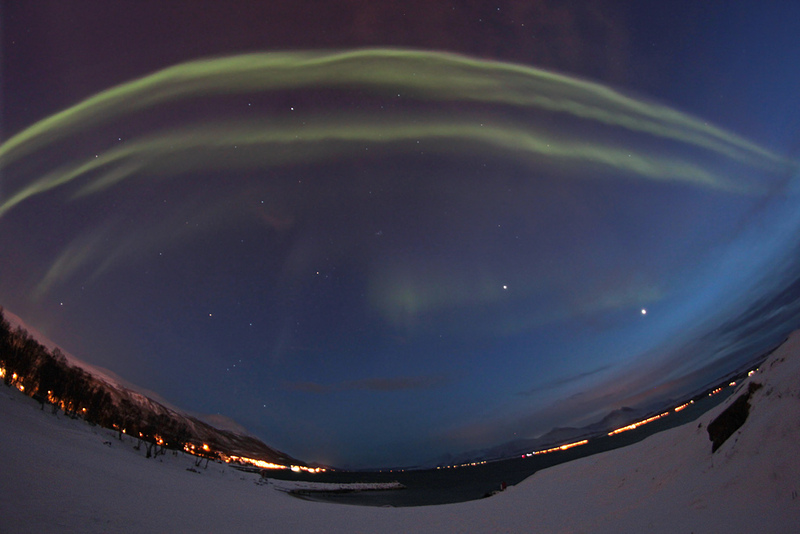 It was so impressive to see the aurora dancing overhead while it was still light. I didn’t last very long, after 30 minutes I was fed up with the wind and the cold, and I went home. Not long after, clouds rolled in and ended the show. It started indeed around 4:30 pm, when it was still quite light. For me, it was the first time in my life to see northern lights – and luckily we had no clouds and the light show continued the whole evening. 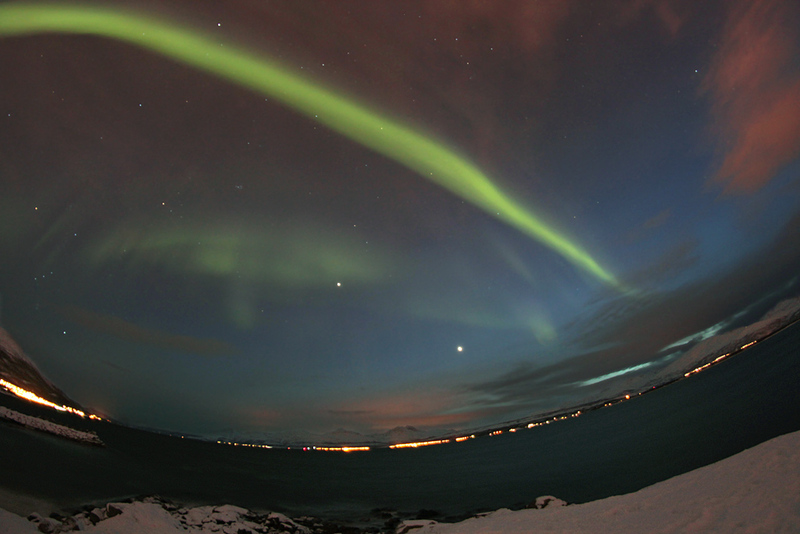 I would have been glad to use your fisheye lens as I could only capture a small part of the aurora. 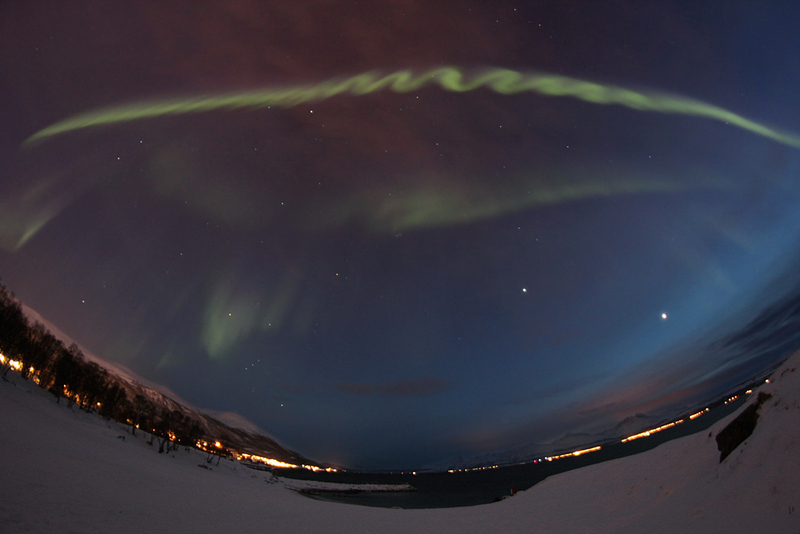 best aurora pictures I’ve ever seen! 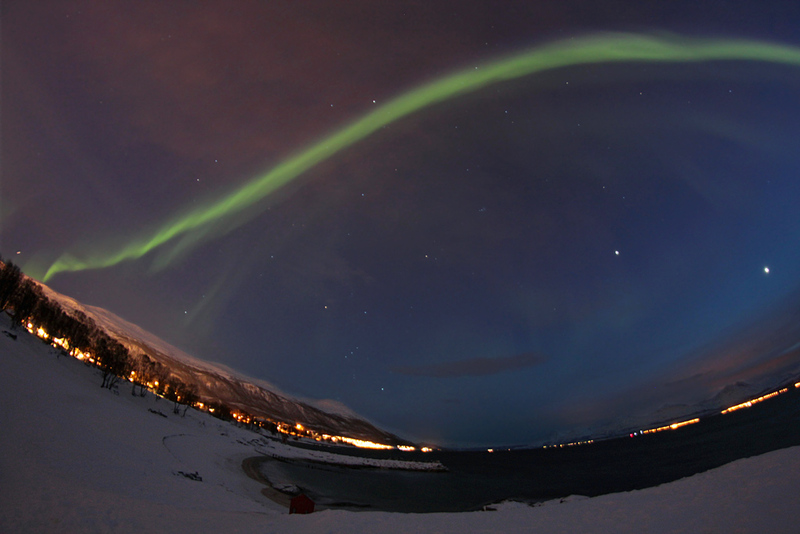 You are so lucky to live in such an amazing location like Tromsø! You have a very nice website too, I especially love the winter photos from Deister – so beautiful! Tromsø is a fantastic place to live, the winter can be long and dark but as long as I get to see the aurora I don’t complain. And the summer is so much fun with the midnight sun.